Stars Breanna Stewart (30) and Stefanie Dolson (31) celebrated after Connecticut beat Notre Dame, 79-58, on Tuesday for the women’s NCAA basketball crown. Their male counterparts defeated Kentucky in the finals the night before. The wins were a repeat of 2004, when UConn became the only school to win both titles. 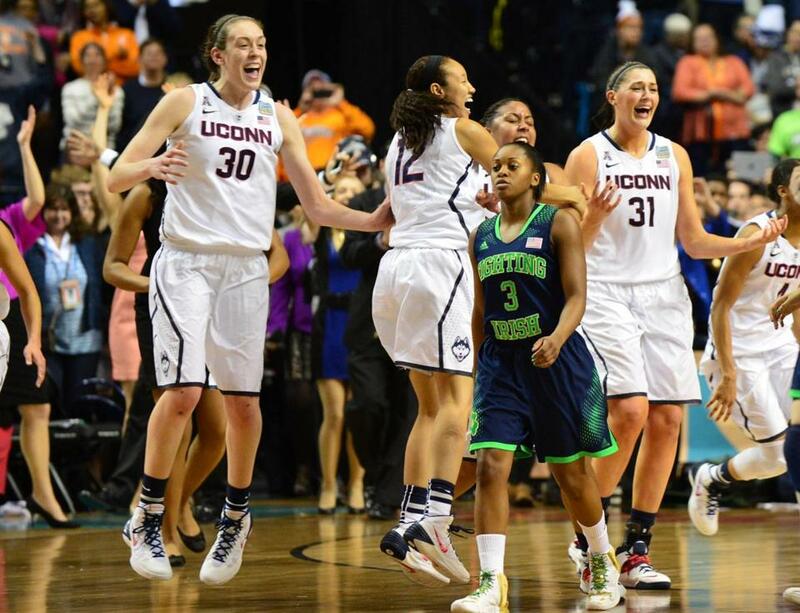 NASHVILLE — It was a perfect ending for UConn. It was perfectly awful for Notre Dame. The Huskies completed their 40-0 season with a 79-58 pummeling of the previously undefeated Fighting Irish (37-1) in the women’s NCAA Tournament championship game Tuesday night. UConn’s national crown was its ninth and came a night after the men’s team completed its improbable title run with a win over Kentucky. There was nothing improbable about the ladies’ run. Picked by many to go undefeated and win their second straight national title, Geno Auriemma’s team was rarely tested this season — and that included Tuesday night. Though the Irish surprised many by arriving in the title game with an unblemished record, they had no answer for UConn’s powerful inside game — the Huskies outscored Notre Dame, 52-22, in the paint. Stefanie Dolson, UConn’s 6-foot-5-inch tower of strength senior center, collected 17 points and 16 rebounds. Breanna Stewart, the national player of the year, chipped in 21 points and nine rebounds, and Kaleena Mosqueda-Lewis added 18. Bria Hartley struggled from the field (4 of 15) but still managed 13 points. As they have all season, the Fighting Irish were led by Kayla McBride, who capped her career with a 21-point, five-rebound effort. Jewell Loyd (13) and Michaela Mabrey (10) also hit double figures for Muffet McGraw’s team. Notre Dame severly missed the presence of its 6-4 senior center, Natalie Achonwa, who tore her ACL in the regional championship win over Baylor. Her replacement, Taya Reimer, managed just 6 points in 28 minutes. And play great they did as UConn repeated its feat of 2004, when the men’s and women’s teams also won the national championship, the only school to do so in basketball. McGraw and Auriemma, native Philadelphians who have butted heads on more than a few occasions — the Irish coach recently noted “the lack of civility” in the heated rivalry with the Huskies — shook hands after the game. The Huskies, who defeated Notre Dame for just the third time in their last 10 meetings, took back-to-back national titles for the first time since 2008-09 and 2009-10, when UConn won after back-to-back 39-0 seasons. It marked the ninth overall title for Auriemma, who broke an NCAA record for most championships he had shared with former Tennessee coach Pat Summit, who made her name in the Volunteer State. Although both teams played each other 15 times in the last four seasons, including four times each in the last three seasons, they never met during the 2013-14 regular season after going their separate ways: ND to the Atlantic Coast Conference and UConn to the American Athletic Conference. Notre Dame, which looked like it was going to get run off the court in the opening minutes — the Huskies roared to a 20-8 lead — did fight back with a run of its own late in the first half, getting to 43-38 on a Loyd 3-pointer. The Irish couldn’t carry it over to the second half however, and any thoughts of the Irish winning won for the Gipper — or Achonwa — quickly fell by the wayside as Dolson, Stewart, and Mosqueda-Lewis continually asserted themselves and converted layup after easy layup. UConn scored 18 of the first 22 points after the break with Dolson and Stewart combining for 10 points. Although Auriemma deserves a lot of credit, the coach deflected it to his players. Material from the Associated Press was used in this report. Michael Vega can be reached at vega@globe.com.